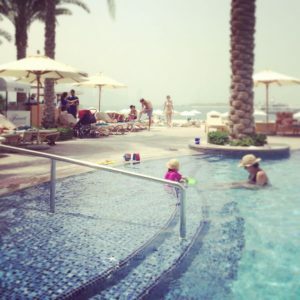 If you are thinking of travelling to Dubai with children in my opinion the most family friendly hotel is Fairmont, the Palm which is both luxurious and child-friendly. It will ensure your holiday is stress-free and fun for all the family – yes parents included! 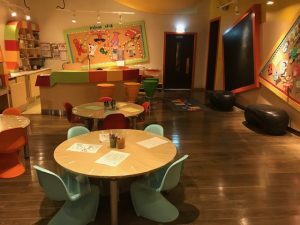 Here is my detailed run-down of why I think it is the place to stay with young children in Dubai. I once heard a saying that “Parents don’t truly go on holidays, they just look after their kids in different cities.” And now as a parent of a young child I can completely relate to this saying; travelling with a toddler can be challenging and stressful at the best of times with little time off to yourself. But things can be made so much easier if you choose the right accommodation and I believe the best hotel will enable you to have time to relax without the kids, as well as build family memories together. 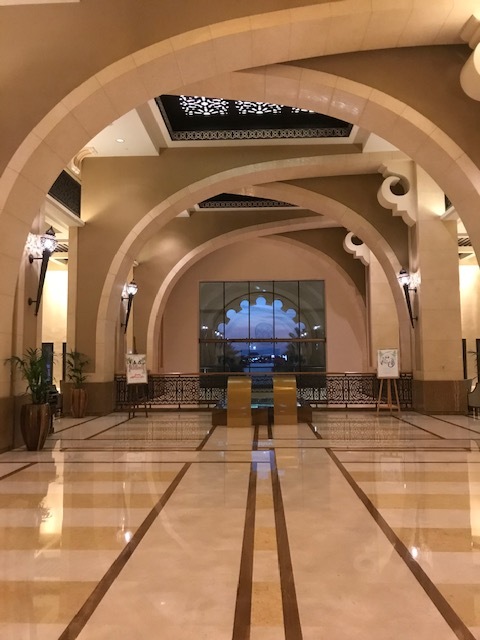 Before we first went to Dubai I wondered what was it about the city that everyone – and I mean everyone – I spoke to recommended it as a great family holiday destination. 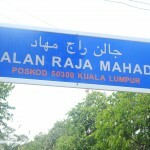 After having been there myself I now understand. Beyond the year round sunshine, cleanliness, low crime rate, friendly locals and modern amenities, the best thing about the city has to be the people. Everywhere we went, including outside of the hotel, the people of Dubai were so child-friendly. We even went to the Dubai Mall and the shop assistant in the Nike store immediately started playing and entertaining our child with some coins she was holding whilst we looked at the shoes! We like Dubai so much we have travelled there with our toddler several times. But with new hotels popping up all the time (and a few golden oldies like Atlantis, the Palm) it can be a challenge to know where to stay. 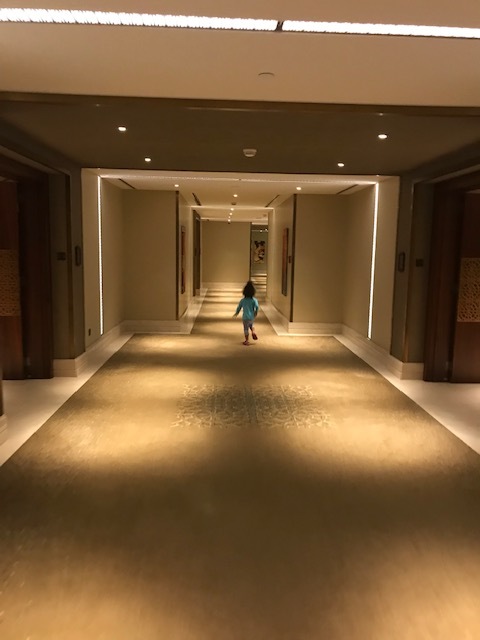 However, in my opinion Fairmont, the Palm hotel is hands down the best hotel to stay with younger children as I explain in this post. From the moment you arrive at check in you can see the hotel have the customers, including children, in mind. Last time we arrived at the Fairmont at 9am due to a very early flight however, like most hotels their standard check-in is not until 3pm. I was really worried that this was going to lead to a very tiring day with a cranky toddler without a place to nap. I had requested in advance an early check-in but as always it wasn’t guaranteed. So we were delighted to hear that the hotel had arranged an early check in for us on arrival. This made the world of difference that we were able to put all our luggage in our room and our entire family had a long morning nap which meant we could catch up on much-needed sleep and it helped us get into the new-time zone routine. We were also departing the hotel at the crack of dawn on our last day so the hotel let us use our complimentary breakfast on the last day on the first day instead so we could eat before our formal check in time started. In the hotel itself, everywhere our daughter went the staff would say hello to her – so much so I think she got fed up of always saying hello by the end of the trip! The hotel has two pools – one for adults only and a family pool. Both have plenty of sun loungers around the pool so you are never without somewhere to pop your bag and towel. Lying down to relax with a toddler may be more tricky! The family pool is busy but never packed, clean and always has several lifeguards on duty at once. There are three different areas to the pool which differ in water depth, with the first level being the perfect depth for toddlers to be able to stand. My daughter loved that she didn’t need me to hold her the whole time and she could walk in the water and splash about herself (accompanied of course). There was also a communal feeling to pool toys with everyone leaving and sharing their balls, floats etc around the pool. We did lose a ball this way as I think someone mistook it for theirs but it was accidental so not something I would worry about. By the side of the pool there are a few table and chairs, an ice-cream counter and a small area you can order some basic children meals and drinks. This is useful when kids inevitably get hungry from swimming and means you do not need to venture away from the pool to feed them. Opposite the family pool there is also a snack bar which serves more adult-type snacks like burgers, sundaes and cocktails under a shade areas but still within viewing distance of the pool if you had older children you could leave unaccompanied (but observed) in the pool. There is also a small outdoor playground under the shade with water jets and sprinkles for children to run around to cool down. There is also a private beach just for hotel guests accessed at the back of the hotel with plenty of loungers that there was always one available, and a big chest of toys (think bucket and spades) for children. It is the small touches like this which really help you as parents because not having to buy or remember to pack a bucket and spade is one less thing to think about! The beach currently has building works happening right outside the hotel but there is always building in Dubai so you get used to this. The hotel were extremely accommodating and apologetic about these works and have put up fences and security to minimise the disruption as a result of the works, despite it being a government project not building works to the hotel. If you are a regular traveller to Dubai you will also know there are always building works happening somewhere in your vicinity as they continue to develop the city. If you are looking for a white sand beach you might be disappointed as it isn’t quite your Thailand or Mauritius on that score. However, the sand was yellow (I hate black sand beaches) and clean. The hotel has sectioned off an area of the sea for hotel guests and there were lifeguards watching. There is a small snack bar at the back of the beach and a watersports counter where you can pay for additional activities. 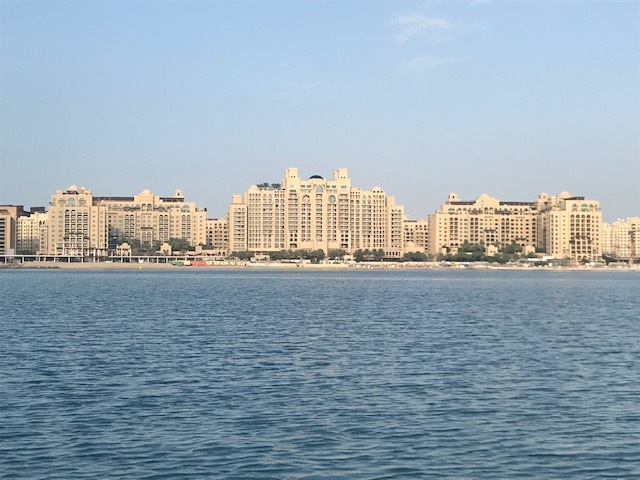 We have taken our daughter on a speed boat ride from the beach around the Palm island which was beautiful and offered great photo opportunities. They are very safety conscious and make sure you and your children wear lifejackets. You can also put all non-inclusive costs (food, drink, snacks, watersports, spa treatments) onto your room if you leave a card as deposit which makes it really easy as you don’t need to remember to carry your wallet around with you when within the hotel. Older children could also be independent and spend the day around the hotel without bothering you and still get themselves food or drinks when needed by putting things onto the room spend. There are around seven restaurants on site ranging from Indian, Brazilian, seafood, pan-Asian to buffet style nights and more. This means there is plenty of choice if you want to eat dinner on-site every evening which I find makes life a lot easier with young children than having to venture out to eat. We have tried all of the restaurants during our stays there and they are all delicious. The buffet restaurant opens at 6pm with the other restaurants opening at 6.30pm, meaning early mealtimes with children were also possible. At meal times you can ask for plastic cups and plates for children to use (the only thing they seemed to lack was plastic cutlery). Our room of choice is the Fairmont View room which can accommodate a pull-out single bed for the toddler. This room is large in size and felt spacious for the three of us (and all my daughter’s belongings; as you know toddlers need a lot of stuff!). The pull-out bed was very sturdy. I should know as I slept on it with our daughter the first night to help her sleep. The room had a balcony attached which not only was very safe for toddlers with a reinforced glass wall high enough that there was no risk at all that she could fall out, but also offered a lovely spot for us to have a drink at night whilst we watched our daughter fall asleep in her bed inside. The room had awesome blackout curtains also which really helped us get into the correct time zone, assist with daytime naps, and prevent being woken at the crack of dawn by the sunlight. Housekeeping would do their regular daily turn down of the beds and once they knew we had a child staying in our room they would make origami animals out of towels to give her each evening which I thought was a very sweet touch. In my view it is essential to have a kid’s club in a hotel if you are to truly enjoy your holiday with a toddler in tow. I know some parents do not feel comfortable leaving their children in a creche in a foreign country which I do understand but if the kid’s club is well staffed with professional people and has safe facilities it can be the turning point of your holiday whilst you and your partner (friends/family whoever you travel with) get to enjoy some quality child-free time for couple of hours and are energised to give your best to your child when you pick them up. 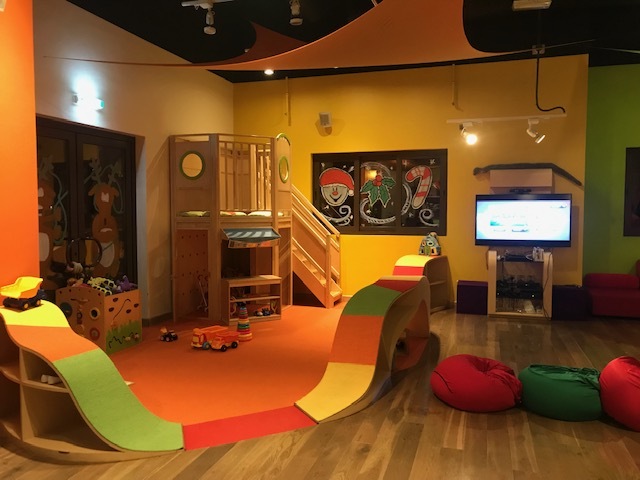 The Fairmont Kid’s Club was impressively equipped with colourful furniture and a huge range of toys, from a climbing wall, games console for older children, and lots of arts and crafts on offer, including face painting. 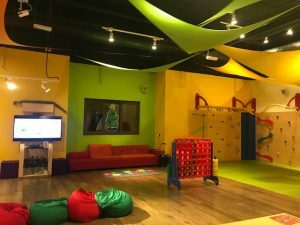 They accept children from age 18 months which is hard to find in Dubai with most kids club starting from age 3. They follow the same staff ratios as in the UK which meant for the under 3s, there was 1 teacher to 3 children maximum. The creche was always well staffed and during our stays (which are during peak season) there is normally more like a 1:2 teacher/child ratio as it is never fully booked. We usually put our daughter in for 2 hour session each day which she really enjoys and we make the most of this time to relax by the adult pool. You must stay within the hotel grounds whilst your child is in the kid’s club and the hotel are very good at contacting you if your child needs you. You can also order them hot meals, snacks and drinks whilst they are in the creche. The hotel give two hours free for the kid’s club for each child over 3 years old with the option to top up beyond that if you wish. For the under 3s you annoyingly don’t get any complimentary hours. They operate a pay as you go model which means you don’t need to book in advance, however it is recommended especially with under 3s as they only take three toddlers at a time (rather than seeing this as a pain I liked it as it gave me confidence on their safeguarding policies). They are very flexible on changing your bookings as I often did if my daughter was tired earlier than planned or slept in a little later (who wants to wake a sleeping child?!). There were quite a lot of children all different ages staying at the hotel and whilst I think the hotel is perfect for younger children, I can see how older kids may get bored as there wasn’t any evening or daytime entertainment for their age beyond the games console in the kid’s club. 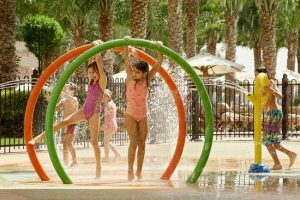 Now what makes a fabulous child friendly hotel is not just the facilities for children, but also the facilities for adults that you can enjoy whilst you get some time alone with the kids entertained. The Fairmont Palm hotel does not disappoint in regards to their spa and it has won numerous awards. During our last stay I had a pregnancy facial one afternoon and a pregnancy massage one evening before bed. The therapists were very professional and both treatments were extremely relaxing. The decor of the spa is beautiful and very high end. It is always blissfully quiet (only saw one other person in the entire spa during my two visits which really gave it the feeling of luxury) and if I wasn’t pregnant I would have made use of the sauna and steam room that you get access to with a treatment. After your treatment you are taken to a relaxation room with the tastiest apple muffins and refreshments. There are chairs and loungers both inside and out on the spa balcony with magazines for you to relax after a treatment. Whilst the spa is fairly expensive (about £100/$130 for an hour’s treatment) I can highly recommend it and say it is well worth some R&R time in peace and tranquility after a busy day playing with the children. The entire hotel oozes decadence as you would expect from a 5 star hotel. What I love is that the hotel itself never feels full despite going during peak season. This is in part down to its spacious design, with huge hallways for kids to run down, large communal grounds, and the extensive number of the numerous restaurants and spacious layout. To me it was the perfect balance of luxury for the adults alongside enough family facilities which made it easy for parents and children alike to have a fun filled and relaxing holiday. I hope from all of the elements of this review I have listed above you can see why I rate this as the best toddler friendly hotel in Dubai. I would like to stress I am not affiliated with this hotel and we paid for this holiday ourselves. My name is Justine (my friends call me ‘Just’). I am a 33 year old female originally from London, UK and writing a hopefully useful blog based on my experiences abroad and as a new Mum.